Cousins completed 30 of 46 pass attempts for 262 yards, two touchdowns and two interceptions in Sunday's 25-20 loss to the Bears. Cousins completed 18 of 22 passes for 164 yards, a touchdown and an interception while rushing twice for three yards and losing a fumble in Sunday's 24-9 win over the Lions. Cousins completed 31 of 41 pass attempts for 359 yards, two touchdowns and an interception in Sunday's 30-20 loss to the Saints. Cousins completed 25 of 40 passes for 241 yards and two touchdowns in Sunday's 37-17 win over the Jets. Analysis: Cousins capitalized on the beat-up Jets secondary on the game's first drive, hitting his favorite target, Adam Thielen, for a 34-yard touchdown. 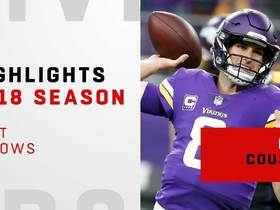 Running back Latavius Murray was Minnesota's biggest offensive weapon the rest of the way with two touchdowns on the ground, but Cousins managed to add a 34-yard aerial strike to Aldrick Robinson, sealing the victory in the fourth quarter. Up next for the marquee free-agent addition is a mouthwatering Week 8 matchup with the vulnerable Saints secondary. Cousins completed 24 of 34 passes for 233 yards, a touchdown and an interception during Sunday's 27-17 win over Arizona. He added 14 yards and a touchdown on four carries and also lost a fumble. Cousins completed 30 of 37 pass attempts for 301 yards and a touchdown during Sunday's game against the Eagles. He also carried five times for one yard and lost a fumble in the 23-21 win. Analysis: Cousins completed an impressive 81.1 percent of his passes and spread the ball around to eight different receivers. 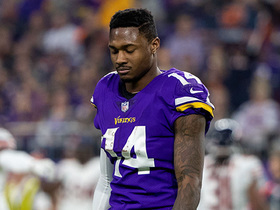 He threw a three-yard touchdown pass to Adam Thielen in the second quarter and later committed a fumble in his own territory, though the defense bailed him out by forcing a punt. Cousins has gone two straight games without throwing an interception and now has an 11:2 TD:INT through five games. He'll look to continue his strong start to the season next Sunday against the Cardinals. 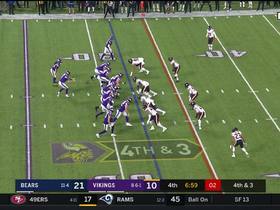 Cousins completed 36 of 50 passes for 422 yards with three touchdowns and no interceptions in the Vikings' 38-31 loss to the Rams on Thursday night. He also rushed four times for 28 yards, threw a two-point conversion pass and lost a fumble. Cousins completed 40 of 55 pass attempts for 296 yards, one touchdown and one interception Sunday against the Bills. 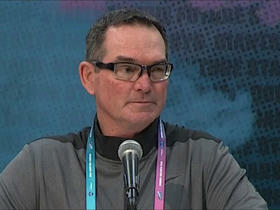 He also gained two yards on two carries and lost a pair of fumbles in the 27-6 loss. Cousins completed 35 of 48 pass attempts for 425 yards, four touchdowns and one interception Sunday against the Packers. He also carried two times for five yards in the 29-29 tie. 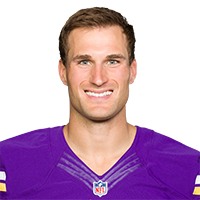 Cousins completed 20 of 36 passes for 244 yards with two touchdowns and no interceptions in the Vikings' 24-16 win over the 49ers on Sunday. He also rushed four times for 26 yards. Analysis: Cousins put to rest any doubts about his degree of chemistry with new wideouts Adam Thielen and Stefon Diggs, hitting the duo for a combined nine catches, 145 yards and a touchdown. The veteran signal-caller also put the services of returning running back Dalvin Cook to good use, hitting the FSU product on six occasions for 55 yards. Having put together a clean Vikings debut, Cousins will look to keep the momentum going against the Packers in an intriguing Week 2 divisional matchup. Cousins completed 17 of 28 passes for 182 yards with no touchdowns or interceptions during Friday's preseason game against the Seahawks. He also rushed once for two yards. Cousins was just 3-of-8 for 12 yards passing in Saturday's preseason loss to Jacksonville while playing four series on offense. Analysis: Cousins didn't look as sharp as in his first preseason game, but the Jaguars have a top defense, his offensive line was missing several starters and Latavius Murray lost a fumble. We wouldn't read too much into his performance as has time to work out the kinks before the regular season. Cousins made his Vikings debut during Saturday's preseason game against the Broncos and completed all four of the passes he threw for 42 yards and one touchdown. Analysis: Cousins only got one drive but he certainly made the most of it, especially given his matchup with the Broncos' stout defense. The highlight of his day was a beautiful 28-yard dime to Stefon Diggs that set up Cousins' first career touchdown as a Viking. The quarterback will look to continue his impressive play during Minnesota's second preseason game next Saturday against the Jaguars. Cousins will remain on the field for as long as the starting offensive line does during Saturday's preseason game in Denver, Jon Krawczynski of The Athletic Minnesota reports. The Vikings officially signed Cousins to a three-year contract Thursday. Cousins plans to sign a three-year, fully-guaranteed contract with the Vikings on Thursday, Adam Schefter of ESPN reports. Cousins will start free agency with a visit to Minnesota, where he already has a three-year, $84 million offer on the table, Ian Rapoport of NFL Network reports. The Redskins didn't use the franchise tag on Cousins this offseason, Matthew Paras of The Washington Times reports. Cousins isn't expected to receive the franchise tag, Kimberley A. Martin of The Washington Post reports. The Redskins haven't ruled out using the franchise tag on Cousins, Adam Schefter of ESPN reports. Following Washington's pending acquisition of fellow QB Alex Smith, which caught Cousins by surprise, free agency awaits the 29-year-old signal-caller March 14, ESPN's John Keim reports. With Alex Smith being traded to the Redskins, Cousins is expected to enter free agency, Ian Rapoport of NFL Network reports. Analysis: Cousins has been franchised tagged by the Redskins the past two seasons but the quarterback will now have the opportunity to sign a lucrative long-term deal elsewhere. Cousins instantly becomes one of the top commodities in the open market after recording three straight seasons with over 4,000 passing yards and 25 touchdowns. Cousins completed 20 of 37 pass attempts for 158 yards and three interceptions during Sunday's 18-10 loss to the Giants. He also scored a 12-yard touchdown on his lone carry of the game. Cousins completed 19 of 37 pass attempts for 299 yards, three touchdowns and one interception Sunday against the Broncos. He also carried five times for eight yards in the 27-11 win. Cousins completed 18 of 26 passes for 196 yards and two touchdowns in Sunday's 20-15 win over the Cardinals. Analysis: Cousins was held below 200 passing yards for the second consecutive week after topping that mark in all but one of his first 12 games this season. 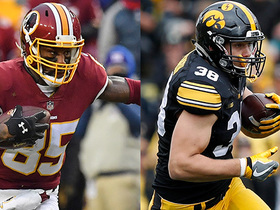 That decline in effectiveness has been the result of injury issues across Washington's offense rather than a decline in Cousins' own oerformance, but that distinction isn't much consolation to his fantasy owners. Next week's game against the Broncos could be the pending free agent's final home tilt in a Redskins uniform. Cousins completed 15 of 27 passes for 151 yards with one touchdown and one interception in Sunday's 30-13 loss to the Chargers. He also rushed twice for eight yards. Analysis: Cousins was only brought down twice by the Chargers' ferocious pass rush, but he was pressured plenty and generated his lowest passing yardage total of the season in the process. The six-year veteran's 55.6 percent completion rate was also his lowest of the season, as was the 68.6 rating with which he finished the contest. The Redskins are essentially without postseason hope at 5-8, but Cousins will try to help them break a two-game losing streak against the Cardinals in Week 15. Cousins completed 26 of 37 passes for 251 yards with two touchdowns and two interceptions in Thursday's 38-14 loss to the Cowboys. He also gained six yards on three rushes and fumbled twice, losing one. Cousins completed 19 of 31 passes for 242 yards, two touchdowns, and an interception in Thursday's 20-10 Thanksgiving win over the Giants. Analysis: Cousins was involved in every touchdown during the game, as the Giants' lone score occurred on pick-six of the quarterback in the third-quarter. He was relatively efficient outside of the interception on a night where offense was hard to come by. The 29-year-old has now thrown multiple touchdowns in consecutive weeks, and will try to string it to three for the first time this season when the Redskins take on the Cowboys in Week 13. Cousins completed 22 of 32 passes for 322 yards and three touchdowns without an interception while rushing three times for 11 yards in Sunday's 34-31 overtime loss to the Saints. Cousins completed 26 of 45 passes for 327 yards, one touchdown and one interception in Sunday's 38-30 loss to the Vikings. He added five yards and two touchdowns on four carries. Cousins completed 21 of 31 pass attempts for 247 yards and no touchdowns in Sunday's 17-14 win over Seattle. He also added four yards on three rushes and lost a fumble. Analysis: It was the first game this season that Cousins didn't throw for a touchdown, and 69 of the yards came on two plays during the game-winning drive. Facing an elite defense on the road with a depleted receiving corps and offensive line, a down game was perhaps to be expected. He was also sacked six times, including once for a safety. The 29-year-old returns home to face another stiff test against Minnesota in Week 10. Cousins likely will be directing an injury-marred Washington offense Sunday in Seattle, ESPN.com's Field Yates reports. 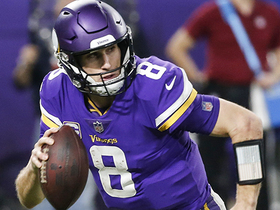 Minnesota Vikings head coach Mike Zimmer explains why he believes quarterback Kirk Cousins will perform better in his second year with the Vikings than he did in his first season with the team. 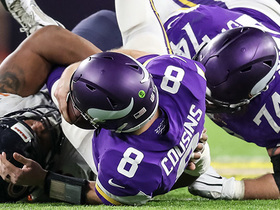 Watch the best throws from Minnesota Vikings quarterback Kirk Cousins of his 2018 season. 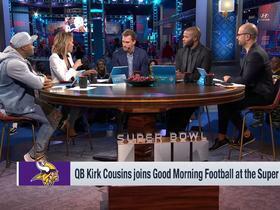 Minnesota Vikings QB Kirk Cousins joins 'Good Morning Football' to discuss what it's like to have Sean McVay as a coach. 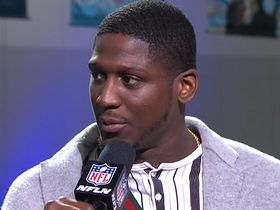 NFL Network's Deion Sanders tries to come up with a New Year's resolution and solution for Minnesota Vikings quarterback Kirk Cousins' current situation. 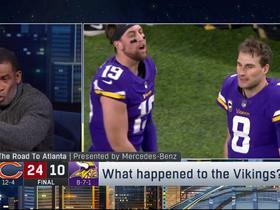 NFL Network's Deion Sanders reacts to the sideline confrontations between Minnesota Vikings quarterback Kirk Cousins and wide receiver Adam Thielen. Chicago Bears defensive end Akiem Hicks pushes past the offensive line and sacks Minnesota Vikings quarterback Kirk Cousins.